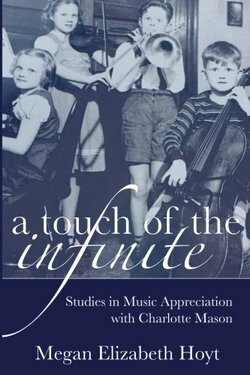 A Touch of the Infinite is the Mason educator's comprehensive, one-volume guide to understanding and implementing Mason methods for Music study. Readers will learn how to teach a Composer Study lesson, the basics of Tonic Sol-fa, Folk Song Study, Hymn Study, Instrument Study, and more. Educators who are eagerly seeking out new knowledge about Charlotte Mason’s methods have already noticed they appear to be governed by certain underlying principles. Just as a slow simmer produces the most flavorful soup, careful attention to the principles outlined in this book will help students form sturdy, life-long relationships with the world of sound that is all around them. To purchase or view an excerpt, click on the image above. I want to implement composer study. Where do I begin? I tried to cover each facet of a Charlotte Mason music education thoroughly in A Touch of the Infinite, and in the back I have listed her programmes for music, the books she used, and some practical insights I gleaned along the way. If you’re just starting out, choose a fun composer! I like to start with Rossini because he wrote "The Lone Ranger theme," otherwise known as The William Tell Overture, and the cat concerto. The lyrics to the cat concerto are Meeeow! Meeow! You could also begin with Benjamin Britten or Tchaikovsky. Most children will recognize The Nutcracker and Swan Lake. If you can’t manage to fit in anything else, do listen to six pieces per term and have your children try to identify the instruments they hear. You can move forward from there. If your children are very young, the first thing you need to do is lay down the habit of attention to what they hear. Children need to become strong listeners! Next, teach them nursery rhymes and songs with hand motions. Teach them rhythm. Teach them to jump rope, so they will learn how to keep a natural rhythm. Have them match the notes you play on the piano. Give them access to live performances if you can. Does your nearest symphony orchestra have a petting zoo? Allow your children to get some hands-on experience with real orchestral instruments. If you take them to a performance and they get wiggly or loud, feel free to take them home before the concert ends. Your goal is not to teach them that concerts are stuffy, boring places where they have to sit still (though they do need to learn to sit still). Let them make up their own songs, and if you can, write them down in their music notebooks. Miss Mason said children need something to do, something to love, and something to think about. When it comes to music, help them become active listeners, let them make their own instruments out of tissue boxes and rubber bands, sing them to sleep instead of turning on their favorite cd. Let them develop a love for music, and let music become something sweet and pleasant for them. What if I don't know the musical terms or can't read music? Don't panic. You can learn right alongside your child, and google is going to become your best friend. Look up the composer you've chosen and find a short biography about him. Read it to your child. Go to Classics for Kids, and listen to their short podcasts. Look up any musical terms you don't understand and find examples of them online. Youtube will be your next best friend. You can find most orchestral pieces on youtube, and some are even performed by children. I wrote several blog posts about composer study and music in general at my blog: thewindingascent.blogspot.com . I hope they are of some help to you! Don't forget to check out the links at the bottom of the first blog post. There are some excellent resources listed there.